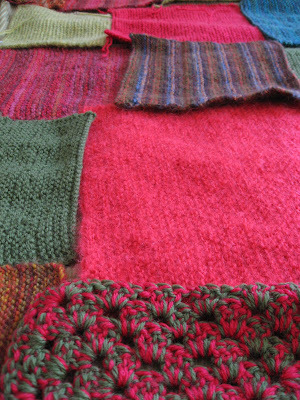 So last week I had the chance to go to a friend’s ‘knit in’. What is a knit in I hear you ask? Well bloody good question – I’d never been to one before and wasn’t exactly sure either. It was seven women, several bottles of good red wine, snacks, music, comfortable chairs, and sticks and thread – knitting needles, crochet hooks, wool, acrylic yarn. For close to 4 hours we sat and chatted, got to know each other (the women all knew the host but we didn’t all know each other), nibbled, drank, told stories, and laughed. I heard about pets and career changes and life changing accidents, and neighbours and travel and good boot stores. I heard snippets of conversation about the who’s who of my industry, about other knitting projects, about boyfriends left overseas, about job dreams, about lifting weights in the gym. I saw the resident cat come and hunt a ball of wool and stalk off with it, saw other things my friend has made recently, and had my first crochet lesson (I did some! 3 stitches to two, take off the second, start again... hmm, made sense at the time)… I toe tapped to George Michael and I almost finished a knitted square for the Wrap with Love project (see below – I seem obsessed with it, every second post is about my emerging blanket at the moment!). All of the squares started that night were for the blanket project – so I got to take them away at the end because I will be going near the drop off point this week anyway. Ah, because you see, this Friday at the ABC on Harris Street in the City, there is the annual ‘knit in’ of grand proportions. Starts really early I think, and you get to knit in company, or help sew up the existing squares. 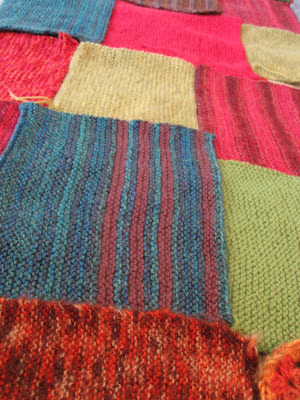 Meanwhile, back at the ranch, my mum has joined in and posted me a parcel of amazing squares she’s knitted – lovely soft, hairy, stripy, colourful squares (her knitting is so even compared to mine, not a dropped stitch anywhere! ), my housemate is knitting one on the diagonal (you know, where you increase every row until you’ve made a triangle and it’s half the size you want your square to be and then decrease every row to go back to the pointy end of the triangle at the bottom) using up the scraps of wool in stripes. I was going for a pink and green theme, and had planned to stitch it up myself and give the blanket finished to the group that organises it, but I am trying different colour combos with the extra squares that other folk have made (pics below). I’m thinking I’ll be able to sew up a blanket and have loose squares left over, which other people can use in theirs for Friday’s knit in. Funny starting something yourself and then considering how to include other people’s contributions – am reflecting on my own control-freak tendencies, and (sure completely subjective) aesthetic boundaries. I don’t mind so much exactly what colours end up in it (fibber – I kind of do), but I want it to look nice, and cared for and not too scrappy, so that whoever ends up getting it doesn’t think it was done without thought. I had been thinking it would be nice to make it the way I’d like something to snuggle up with on a cold night – but maybe this is missing the point a bit? Maybe people who are out in the cold because of loosing their homes wont care if it doesn’t look like a ‘throw for the couch’ and instead wont even notice the colour scheme because they will be in temporary accommodation and have bigger things on their mind. This is probably obvious – but it’s easy to forget that perspective when you’re choosing wool and casting on in front of the tellie ion a warm room. Mind you, one of the squares knitted on Saturday night (by the most lovely lady) was kind of scratchy, brown flecks with a thick yellow stripe up one end, and actually a rectangle. I have tried, but don’t think I can include it in my pink and green (/blue/orange/maybe fawn) project. I’m sure though, that along with some other rusty colours, or in a completely rainbow, beautiful eclectic blanket it will look great.